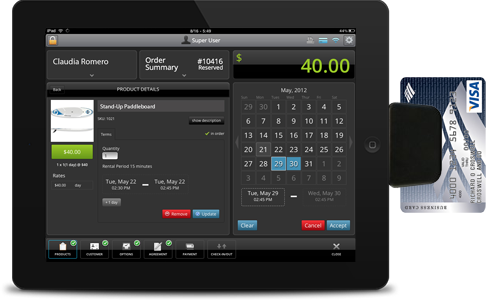 Oak POS for Rental. A new kind of POS. iPad App for In-Store + Online Storefront for your Website. Oak lets you create, edit and retrieve orders, whether they are created online, over the phone or in store. We have been building this technology for the past 3 years and this mature product is now available to your Rental Store. With our integrated Credit Card reader, your orders get automatically updated as you process or receive payments. Online or In-Store. Login to your Oak account to download all the custom reports you need for your accounting and view charts analyse how your business is doing. Interested in learning more? Get in touch with Oak. Make sure you include how many SKUs you plan on managing, the structure of your business and how online orders can help you grow your revenue. Need some help? We have an awesome Helpdesk System. Our Knowledge Base should also help you find the answer. We usually respond to your help inquiries within 6 hours. Let us know how we can help.